Blog – What is an Air Compressor used for? 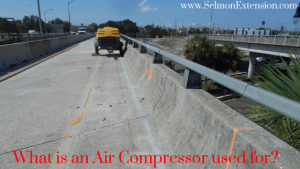 This specific air compressor supplies compressed air to drive equipment like the jackhammers Selmon Extension construction crews are using to break up the existing concrete on the overhead bridge at the Dale Mabry Highway interchange. BLOG – What is 57 Stone? BLOG – What is a Bridge Deck Screed? We Care and Want to Hear From You!